Betonline eSports Betting - BONUS Up UP TO $1 000 ! For an eSports betting site it may take years to build a reputation, but ruining it is a matter of minutes. This is a principle that BetOnline seems to follow. Why is everyone talking about it? We will be sharing the secrets in this review. The most important thing a punter needs to check before registering at an eSports betting site is the licensing details of the website. It is imperative to know where the license is obtained from. For many years, BetOnline, a Panama-based sportsbook, has been offering betting services and is fully licensed. The reason why this site has become so popular is that it caters to sports gambler all over the world. Whether you are in the Australia or UK and looking for first-class eSports betting, a BetOnline account is worth opening. The reason we are reviewing the site is that we have found it to be legit gambling service and it is important that you learn the whole story behind the company before you create an account. With a dedicated eSports page with several markets on some of the most famous international titles, BetOnline has impressed us. In this review, you will find out about the extensive wagering options for the Australian sports as well as the casino and poker. Find out the benefits of betting on eSports at BetOnline and why the available bonuses are not as attractive as advertised. Currently, BetOnline.ag is giving new sports bettors a 50% match up bonus on their first deposit. If you open an account today, you can claim a welcome offer capped at $2500 after placing a bet on the sportsbook. It is important for you to read and understand the terms and conditions regarding the sign-up bonus on the Promotions page. To be eligible for this sign-up bonus, you must deposit at least $25 and use the promo code NEW2500 when checking out. On the same page, you will find the available promotions and information on the comp club that rewards you extra money for your sports betting actions. Another matchup bonus of 100% is offered to players who deposit funds using Bitcoin for the first time. The requirement for this bonus is a minimum deposit of $20 which will be matched up to a maximum value of $1000. The promo code for Bitcoin bonus is BTC2017. Note that BetOnline has wagering conditions or rollover rates for all bonuses. Players must clear certain amounts before withdrawing their bonus winnings. At the moment, the wagering condition is a 10X rollover for welcome bonus and 14X for Bitcoin bonus. These wagering requirements are higher than in other sites like Bovada which gives a 6X rollover rate plus a generous Bitcoin welcome bonus. Basically, you are expected to bet the stipulated rollover rates multiplied by the first deposit and bonus for you to retrieve the winnings. Considering the fact that BetOnline has a 30-day block before requesting the bonus, the offers may not be as attractive as they seem. In essence, the welcome bonuses appear to be lucrative but the wagering conditions outweigh their real value. It means you have to burn through your bankroll before you enjoy the winnings you’ve made with those bonuses. 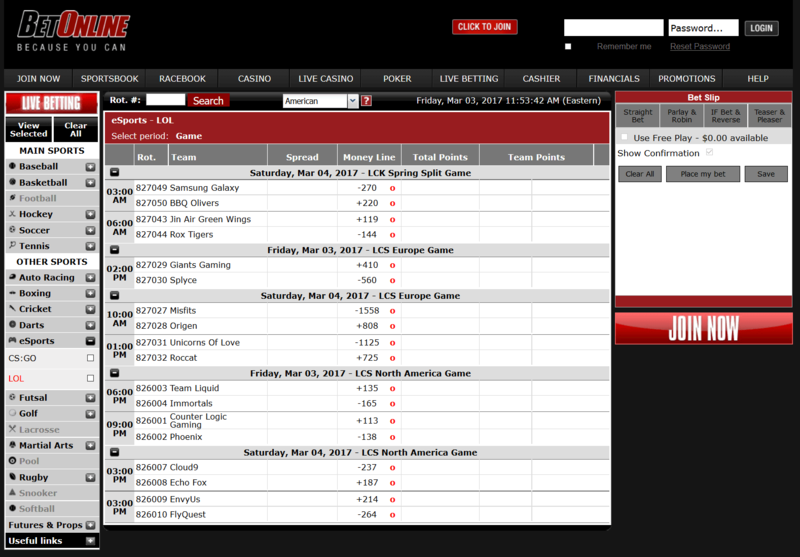 The BetOnline Sportsbook is really nice with everything organized into sections at the left-hand side of the homepage. If you click each category, you are directed to a long list of tournaments and events which you can bet on. Note that the site highlights the only leagues that are going on at the moment. For instance, here is the list of games we found at the time of writing this review. If you have a favorite league or sport you want to bet on but can’t see it on the list, it is best to wait for a while and check if it has been updated. Ensure that you’ve checked for updates when your favorite sport is in season. Besides the above sports, there is a live betting Betonline portal but it has a limited scope. And when we visited the casino section, we found the site to be more inclusive than its counterparts and plenty of games to bet on. Among the many casino games include 3D slots, video poker, table games, skill games, in addition to a live casino. An extensive range of payment options is available at BetOnline with an in-depth FAQ section for addressing common issues associated with deposits and withdrawals. Deposit options at BetOnline include Bitcoin, Litecoin, Ethereum, Visa, Mastercard, Person to Person, Money Order, Neteler, Skrill, Check, Bank wire, WU Pay, Money Gram, and American Express. This is one feature that puts BetOnline apart from most US-facing sportsbooks which restrict bettors especially when they want to withdraw their winnings. We, therefore, find BetOnline less cumbersome because players don’t need to go through the hassle involved in sites featuring limited payment options. For further information on the transaction fees, and cash out timeframes, and the deposit/withdrawal limits, visit the cashier page of the site. Keep in mind that the only acceptable currency at BetOnline.ag is the US dollar. This is because the site mainly caters to North Americans. If you come from another country, you need to know that currency conversion rates will apply before you start betting. BetOnline.ag is an all-encompassing gambling platform with a casino and Sportsbook that dates back to 1991. The reason it has maintained its high-status quo for almost three decades is due to a solid reputation and a proven track record. As you have seen, the sportsbook has a whole host of sports you can place bets on. From our analysis, the types of bets offered here come with creative opportunities for the players to optimize their profits as they push their limits. The other thing we’ve fallen in love with is the simple and uncluttered interface that makes the placing of wagers easy since there are no distractions like what is found in some glitzy gambling sites. For this and other aforementioned reasons, we highly recommend this all-in-one bookmaker to any serious bettor.